Superior Promos Promotional Products and Items Blog » Blog Archive » Promotional Items: Are They Just for Business? Promotion is in every aspect of daily life whether it is at breakfast reading the back of a cereal box, listening to the radio absently gazing at the billboards on the way to work or in the evening watching your favorite television show we are bombarded constantly with advertisement of one sort or another. The internet has become one seething electronic advertisement touting everything from good looks are possible for you too, then finding just the perfect person to spend your life with, not to forget the ever present get rich quick formulas to make your life complete. A never ending plethora of promotion it would seem. STOP, let me get off here you say to yourself. The scenario plays out day after day until refreshment takes place as something useful is presented. Finally something I can actually use in this day of media frenzy we say to ourselves. What is this magical thing that has come into our everyday existence? Is it a bird, a plane, no it’s a useful promotional item! Really getting down to the meat of the subject do you only receive a promotional item when someone calls on you at your business? No, as you attend various events in your life organizations come into play. Donated blood at the blood drive and we received what, an imprinted t-shirt with the organization’s logo. As intentions are good in distributing promotional items for organizations we accept the shirt and wear it promoting that organization as well as their particular message. What about paying to receive promotion? We say never until approached by a school child to purchase promotional items for schools aka booster items throughout the school year. Reflecting on the former elements it would seem that imprinted items are not just for business. Let us explore further this elusive device. Promotional items for business are in fact imprinted products that are intended to bring about brand recognition and ideally be utilized either in the workplace or to promote awareness, products-services to a consumer. 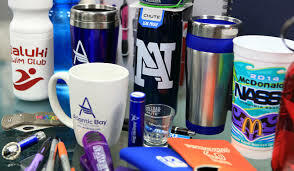 Selection of business promotional items is predicated upon the promotion target market. Business to business promotion would utilize items such as pens and custom sticky notes printed with a company logo for everyday in-office advertising. Special corporate events or higher revenue yielding clients can warrant promotional travel mugs fully satisfying their business worth. On the other hand business to consumer promotion would entail a useful logo imprinted promotional rain gauges or thermometers for examples of at the home promotion. Promotional items for business are in fact used for targeting brand recognition, advertising to consumers, charitable organization participants, schools as well as for business promotion.